Historical materialism (also materialist conception of history) is a methodology used by some communist and Marxist historiographers that focuses on human societies and their development through history, arguing that history is the result of material conditions rather than ideas. This was first articulated by Karl Marx (1818–1883) as the "materialist conception of history." It is principally a theory of history which asserts that the material conditions of a society's mode of production or in Marxist terms, the union of a society's productive forces and relations of production, fundamentally determine society's organization and development. Historical materialism is an example of Marx and Engel's scientific socialism, attempting to show that socialism and communism are scientific necessities rather than philosophical ideals. Historical materialism is materialist as it does not believe that history has been driven by individual's consciousness or ideals, but rather ascribes to the philosophical monism that matter is the fundamental substance of nature and henceforth the driving force in all of world history; this drove Marx and other historical materialists to abandon ideas such as rights (e.g. "right to life, liberty, and property" as liberalism professed). In contrast, idealists believe that human consciousness creates reality rather than the materialist conception that material reality creates human consciousness. This put Marx in direct conflict with groups like the liberals who believed that reality was governed by some set of ideals. Since Marx's time, the theory has been modified and expanded by some writers. It now has many Marxist and non-Marxist variants. Many Marxists contend that historical materialism is a scientific approach to the study of history: scientific socialism. This book defends what we call "historical materialism", and the word materialism grates upon the ears of the immense majority of British readers... I hope even British respectability will not be overshocked if I use, in English as well as in so many other languages, the term "historical materialism", to designate that view of the course of history which seeks the ultimate cause and the great moving power of all important historic events in the economic development of society, in the changes in the modes of production and exchange, in the consequent division of society into distinct classes, and in the struggles of these classes against one another. Marx's initial interest in materialism is evident in his doctoral thesis which compared the philosophical atomism of Democritus with the materialist philosophy of Epicurus as well as his close reading of Adam Smith and other writers in classical political economy. A caricature of Max Stirner drawn by Friedrich Engels. Stirner's 1844 work The Unique and its Property prompted Marx and Engels to theorize a scientific approach to the study of history, which they first laid out in The German Ideology (1845) along with a lengthy rebuttal of Stirner's own critique of socialism. Marx and Engels first state and detail their materialist conception of history within the pages of The German Ideology, written in 1845. The book, which structural Marxists such as Louis Althusser regard as Marx's first 'mature' work, is a lengthy polemic against Marx and Engels' fellow Young Hegelians and contemporaries Ludwig Feuerbach, Bruno Bauer, and Max Stirner. Stirner's 1844 work The Unique and its Property had a particularly strong impact on the worldview of Marx and Engels: Stirner's blistering critique of morality and whole-hearted embrace of egoism prompted the pair to formulate a conception of socialism along lines of self-interest rather than simple humanism alone, grounding that conception in the scientific study of history. In a foreword to his essay Ludwig Feuerbach and the End of Classical German Philosophy (1886), three years after Marx's death, Engels claimed confidently that "the Marxist world outlook has found representatives far beyond the boundaries of Germany and Europe and in all the literary languages of the world." Indeed, in the years after Marx and Engels' deaths, "historical materialism" was identified as a distinct philosophical doctrine and was subsequently elaborated upon and systematized by Orthodox Marxist and Marxist–Leninist thinkers such as Eduard Bernstein, Karl Kautsky, Georgi Plekhanov and Nikolai Bukharin. This occurred despite the fact that many of Marx's earlier works on historical materialism, including The German Ideology, remained unpublished until the 1930's. In the early years of the 20th century, historical materialism was often treated by socialist writers as interchangeable with dialectical materialism, a formulation never used by Marx or Engels. According to many Marxists influenced by Soviet Marxism, historical materialism is a specifically sociological method, while dialectical materialism refers to the more general, abstract philosophy underlying Marx and Engels' body of work. This view is based on Joseph Stalin's pamphlet Dialectical and Historical Materialism, as well as textbooks issued by the Institute of Marxism–Leninism of the Central Committee of the Communist Party of the Soviet Union. The substantivist ethnographic approach of economic anthropologist and sociologist Karl Polanyi bears similarities to historical materialism. Polanyi distinguishes between the formal definition of economics as the logic of rational choice between limited resources and a substantive definition of economics as the way humans make their living from their natural and social environment. In The Great Transformation (1944), Polanyi asserts that both the formal and substantive definitions of economics hold true under capitalism, but that the formal definition falls short when analyzing the economic behavior of pre-industrial societies, whose behavior was more often governed by redistribution and reciprocity. While Polanyi was influenced by Marx, he rejected the primacy of economic determinism in shaping the course of history, arguing that rather than being a realm unto itself, an economy is embedded within its contemporary social institutions, such as the state in the case of the market economy. Perhaps the most notable recent exploration of historical materialism is G. A. Cohen's Karl Marx's Theory of History: A Defence, which inaugurated the school of Analytical Marxism. Cohen advances a sophisticated technological-determinist interpretation of Marx "in which history is, fundamentally, the growth of human productive power, and forms of society rise and fall according as they enable or impede that growth." Several scholars have argued that historical materialism ought to be revised in the light of modern scientific knowledge.[who?] Jürgen Habermas believes historical materialism "needs revision in many respects", especially because it has ignored the significance of communicative action. In the early 1980s, Paul Hirst and Barry Hindess elaborated a structural Marxist interpretation of historical materialism. Historical materialism builds upon the idea of historical progress that became popular in philosophy during the Enlightenment, which asserted that the development of human society has progressed through a series of stages, from hunting and gathering, through pastoralism and cultivation, to commercial society. Historical materialism rests on a foundation of metaphysical materialism, in which matter is considered primary and ideas, thought, and consciousness are secondary, i.e. consciousness and human ideas about the universe result from material conditions rather than vice versa. Historical materialism springs from a fundamental underlying reality of human existence: that in order for subsequent generations of human beings to survive, it is necessary for them to produce and reproduce the material requirements of everyday life. Marx then extended this premise by asserting the importance of the fact that, in order to carry out production and exchange, people have to enter into very definite social relations, or more specifically, "relations of production". However, production does not get carried out in the abstract, or by entering into arbitrary or random relations chosen at will, but instead are determined by the development of the existing forces of production. How production is accomplished depends on the character of society's productive forces, which refers to the means of production such as the tools, instruments, technology, land, raw materials, and human knowledge and abilities in terms of using these means of production. The relations of production are determined by the level and character of these productive forces present at any given time in history. In all societies, Human beings collectively work on nature but, especially in class societies, do not do the same work. In such societies, there is a division of labour in which people not only carry out different kinds of labour but occupy different social positions on the basis of those differences. The most important such division is that between manual and intellectual labour whereby one class produces a given society's wealth while another is able to monopolize control the means of production and so both governs that society and lives off of the wealth generated by the labouring classes. Marx identified society's relations of production (arising on the basis of given productive forces) as the economic base of society. He also explained that on the foundation of the economic base there arise certain political institutions, laws, customs, culture, etc., and ideas, ways of thinking, morality, etc. These constitute the political/ideological "superstructure" of society. This superstructure not only has its origin in the economic base, but its features also ultimately correspond to the character and development of that economic base, i.e. the way people organize society, its relations of production, and its mode of production. G.A. Cohen argues in Karl Marx's Theory of History: A Defence that a society’s superstructure stabilizes or entrenches its economic structure, but that the economic base is primary and the superstructure secondary. That said, it is precisely because the superstructure strongly affects the base that the base selects that superstructure. As Charles Taylor puts it, "These two directions of influence are so far from being rivals that they are actually complementary. The functional explanation requires that the secondary factor tend to have a causal effect on the primary, for this dispositional fact is the key feature of the explanation." It is because the influences in the two directions are not symmetrical that it makes sense to speak of primary and secondary factors, even where one is giving a non-reductionist, "holistic" account of social interaction. Humans are inevitably involved in productive relations (roughly speaking, economic relationships or institutions), which constitute our most decisive social relations. These relations progress with the development of the productive forces. They are largely determined by the division of labor, which in turn tends to determine social class. Relations of production are both determined by the means and forces of production and set the conditions of their development. For example, capitalism tends to increase the rate at which the forces develop and stresses the accumulation of capital. The relations of production define the mode of production. E.g. the capitalist mode of production is characterized by the polarization of society into capitalists and workers. The superstructure—the cultural and institutional features of a society, its ideological materials—is ultimately an expression of the mode of production on which the society is founded. Every type of state is a powerful institution of the ruling class; the state is an instrument which one class uses to secure its rule and enforce its preferred relations of production (and its exploitation) onto society. When a given relations of relations no longer supports further progress in the productive forces, either further progress is strangled, or 'revolution' must occur. “ (a) The productive forces tend to develop throughout history (the Development Thesis). In saying that productive forces have a universal tendency to develop, Cohen’s reading of Marx is not claiming that productive forces always develop or that they never decline. Their development may be temporarily blocked, but because human beings have a rational interest in developing their capacities to control their interactions with external nature in order to satisfy their wants, the historical tendency is strongly toward further development of these capacities. The main modes of production that Marx identified generally include primitive communism, slave society, feudalism, and capitalism. In each of these social stages, people interacted with nature and production in different ways. Any surplus from that production was distributed differently as well. To Marx, ancient societies (e.g. Rome and Greece) were based on a ruling class of citizens and a class of slaves; feudalism was based on nobles and serfs; and capitalism based on the capitalist class (bourgeoisie) and the working class (proletariat). To historical materialists, hunter-gatherer societies, also known as primitive communist societies, were structured so that economic forces and political forces were one and the same. Societies generally did not have a state, property, money, nor social classes. This inherently makes them communist in social relations although primitive in productive forces. Slave societies, the ancient mode of production, were formed as productive forces advanced, namely due to agriculture and the abandonment of nomadic society. Slave societies were marked by their use of slavery and minor private property; production for use was the primary form of production. Slave society is considered by historical materialists to be the first class society formed of citizens and slaves. Surplus was distributed to the citizens, which exploited the slaves. The feudal mode of production emerged from slave society (e.g. in Europe after the collapse of the Roman Empire), coinciding with the further advance of productive forces. Feudal society's class relations were marked by an entrenched nobility and serfdom. 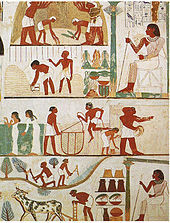 Simple commodity production existed in the form of artisans and merchants. This class would grow in size and eventually form the bourgeoisie. Despite this, production was still largely for use. The capitalist mode of production materialized when the rising bourgeois class grew large enough to institute a shift in the productive forces. The bourgeoisie's primary form of production was in the form of commodities, i.e. they produced with the purpose of exchanging their products. As this commodity production grew, the old feudal systems came into conflict with the new capitalist ones; feudalism was then eschewed as capitalism emerged. The Bourgeoisie's influence expanded until commodity production became fully generalized. With the rise of the bourgeoisie came the concepts of nation-states and nationalism. Marx argued that capitalism completely separated the economic and political forces. Marx took the state to be a sign of this separation — it existed to manage the massive conflicts of interest which arose between the proletariat and bourgeoisie in capitalist society. Marx observed that nations arose at the time of the appearance of capitalism on the basis of community of economic life, territory, language, certain features of psychology, and traditions of everyday life and culture. In the Communist Manifesto Marx and Engels explained that the coming into existence of nation-states was the result of class struggle, specifically of the capitalist class's attempts to overthrow the institutions of the former ruling class. Prior to capitalism, nations were not the primary political form. Vladimir Lenin shared a similar view on nation-states. There were two opposite tendencies in the development of nations under capitalism. One of them wass expressed in the activation of national life and national movements against the oppressors. The other was expressed in the expansion of links among nations, the breaking down of barriers between them, the establishment of a unified economy and of a world market (globalization); the first is a characteristic of lower-stage capitalism and the second a more advanced form, furthering the unity of the international proletariat. Alongside this development was the forced removal of the serfdom from the countryside to the city, forming a new proletarian class. This caused the countryside to become reliant on large cities. Subsequently, the new capitalist mode of production also began expanding into other societies that had not yet developed a capitalist system (e.g. the scramble for Africa). Modern bourgeois society, with its relations of production, of exchange and of property, a society that has conjured up such gigantic means of production and of exchange, is like the sorcerer who is no longer able to control the powers of the nether world whom he has called up by his spells. [...] The productive forces at the disposal of society no longer tend to further the development of the conditions of bourgeois property; on the contrary, they have become too powerful for these conditions, by which they are fettered, and so soon as they overcome these fetters, they bring disorder into the whole of bourgeois society, endanger the existence of bourgeois property. The bourgeoisie, as Marx stated in the Communist Manifesto, has "forged the weapons that bring death to itself; it has also called into existence the men who are to wield those weapons — the modern working class — the proletarians." Historical materialists henceforth believe that the modern proletariat are the new revolutionary class in relation to the bourgeoisie, in the same way that the bourgeoisie was the revolutionary class in relation to the nobility under feudalism. The proletariat, then, must seize power as the new revolutionary class in a dictatorship of the proletariat. Within the co-operative society based on common ownership of the means of production, the producers do not exchange their products; just as little does the labor employed on the products appear here as the value of these products, as a material quality possessed by them, since now, in contrast to capitalist society, individual labor no longer exists in an indirect fashion but directly as a component part of total labor. The phrase "proceeds of labor", objectionable also today on account of its ambiguity, thus loses all meaning. What we have to deal with here is a communist society, not as it has developed on its own foundations, but, on the contrary, just as it emerges from capitalist society; which is thus in every respect, economically, morally, and intellectually, still stamped with the birthmarks of the old society from whose womb it emerges. Accordingly, the individual producer receives back from society – after the deductions have been made – exactly what he gives to it. What he has given to it is his individual quantum of labor. For example, the social working day consists of the sum of the individual hours of work; the individual labor time of the individual producer is the part of the social working day contributed by him, his share in it. He receives a certificate from society that he has furnished such-and-such an amount of labor (after deducting his labor for the common funds); and with this certificate, he draws from the social stock of means of consumption as much as the same amount of labor cost. The same amount of labor which he has given to society in one form, he receives back in another. This lower-stage of communist society is, according to Marx, analogous to the lower-stage of capitalist society, i.e. the transition from feudalism to capitalism, in that both societies are "stamped with the birthmarks of the old society from whose womb it emerges." The emphasis on the idea that modes of production do not exist in isolation but rather are materialized from the previous existence is a core idea in historical materialism. There is considerable debate among communists regarding the nature of this society. Some such as Joseph Stalin, Fidel Castro, and other Marxist-Leninists believe that the lower-stage of communism constitutes its own mode of production, which they call socialist rather than communist. Marxist-Leninists believe that this society may still maintain the concepts of property, money, and commodity production. Other communists argue that the lower-stage of communism is just that; a communist mode of production, without commodities or money, stamped with the birthmarks of capitalism. To Marx, the higher-stage of communist society is a free association of producers which has successfully negated all remnants of capitalism, notably the concepts of states, nationality, sexism, families, alienation, social classes, money, property, commodities, the bourgeoisie, the proletariat, division of labor, cities and countryside, class struggle, religion, universal truths, morality, and markets. It is the negation of capitalism. In the 1872 Preface to the French edition of Das Kapital Vol. 1, Marx emphasized that "There is no royal road to science, and only those who do not dread the fatiguing climb of its steep paths have a chance of gaining its luminous summits." Reaching a scientific understanding required conscientious, painstaking research, instead of philosophical speculation and unwarranted, sweeping generalizations. Having abandoned abstract philosophical speculation in his youth, Marx himself showed great reluctance during the rest of his life about offering any generalities or universal truths about human existence or human history. ^ Marx, Karl (1845). "The German Ideology". www.marxists.org. Retrieved 5 March 2019. ^ Marx, Karl (1845). The German Ideology. Retrieved 12 March 2019. ^ Woods, Alan (2016). "What Is Historical Materialism?". In Defence of Marxism. International Marxist Tendency. Retrieved 28 November 2017. ^ Friedrich Engels. "Socialism: Utopian and Scientific". marxists.org. Marxists Internet Archive. Retrieved 6 September 2018. ^ Karl Marx. "Introduction to the French Edition of Engels' Socialism: Utopian and Scientific". marxists.org. Marxists Internet Archive. Retrieved 6 September 2018. ^ Frederick Engels. "Socialism: Utopian and Scientific (Introduction - Materialism)". Marxists Internet Archive. Retrieved 7 December 2011. ^ a b "Karl Marx (Stanford Encyclopedia of Philosophy)". Stanford Encyclopedia of Philosophy. The Metaphysics Research Lab, Center for the Study of Language and Information (CSLI), Stanford University. Retrieved 6 September 2018. ^ Althusser, Louis (1969). For Marx. The Penguin Press. p. 59. ^ "Max Stirner (Stanford Encyclopedia of Philosophy)". Stanford Encyclopedia of Philosophy. The Metaphysics Research Lab, Center for the Study of Language and Information (CSLI), Stanford University. Retrieved 6 September 2018. ^ Welsh, John F. (2010). Max Stirner's Dialectical Egoism, A new interpretation. Lexington Books. pp. 20–23. ^ Erich Fromm. "Marx's Conception of Man". Marxists.org. Retrieved 6 September 2018. ^ Joseph Stalin. "Dialectical and Historical Materialism". marxists.org. Marxists Internet Archive. Retrieved 6 September 2018. ^ Polanyi, K. (1944). The Great Transformation. New York. pp. 44–49. ^ Hann, Chris (29 September 2017). "Economic Anthropology". Economic Anthropology (The International Encyclopedia of Anthropology). John Wiley & Sons, 2018. pp. 1–16. doi:10.1002/9781118924396.wbiea2194. ISBN 9780470657225. ^ Habermas, Jürgen (Autumn 1975). "Toward a Reconstruction of Historical Materialism" (PDF). Theory and Society. 2 (3): 287–300. Retrieved 5 December 2018. ^ Therborn, Göran (1980). Science, Class and Society: on the formation of Sociology and Historical Materialism. London: Verso Books. ^ Hirst, Paul; Hindess, Barry (1975). Pre-Capitalist Modes of Production. London: Routledge & Kegan Paul. ^ Jessop, Bob (2001). "Capitalism, the Regulation Approach, and Critical Realism". In Brown, A; Fleetwood, S; Roberts, J (eds.). Critical Realism and Marxism. London: Routledge. ^ Douglas, Angus (16 December 2015). "Marxism versus Spiral Dynamics Integral". News24. South Africa. Retrieved 5 December 2018. ^ Marx 1993, p. 265. ^ Kay, Hubert (18 October 1948). "Karl Marx". Life. p. 66. ^ Carswell Smart, John Jamieson. "Materialism". britannica.com. Encyclopedia Britannica, Inc. Retrieved 5 December 2018. ^ Marx, Karl (1999). "48". Capital: Critique of Political Economy. 3. Marxists Internet Archive. Retrieved 5 December 2018. ^ Marx, Karl (1999). "2". The Poverty of Philosophy. marxists.org: Marxists Internet Archive. Retrieved 5 December 2018. ^ Callinicos, Alex (2011). The Revolutionary Ideas of Karl Marx. Chicago: Haymarket Books. p. 99. ^ Foster & Clark 2008. ^ Harman, C. A People's History of the World. Bookmarks. ^ Marx, Karl (1848). The Communist Manifesto. London. Retrieved 12 March 2019. ^ Dixon, Norm. "Marx, Engels and Lenin on the National Question". Links International Journal of Socialist Renewal. Retrieved 21 April 2018. ^ "В.И. Ленин. О национальном вопросе и национальной политике" (in Russian). Retrieved 21 April 2018. ^ Marx, Karl (1848). The Communist Manifesto. London. Retrieved 4 April 2019. ^ Marx, Karl. Critique of the Gotha Programme. Retrieved 12 March 2019. ^ Stalin, Joseph. Economic Problems of Socialism in the USSR. Retrieved 12 March 2019. ^ Marx, Karl (1999). "Preface". Capital: Critique of Political Economy. 1. marxists.org: Marxists Internet Archive. Retrieved 5 December 2018. ^ Engels, cited approvingly by E. P. Thompson in 'The peculiarities of the English,' Socialist Register, 1965. ^ "Letter from Marx to Editor of the Otecestvenniye Zapisky". Marxists Internet Archive. Retrieved 10 November 2018. ^ "Letters: Marx–Engels Correspondence 1890". Marxists Internet Archive. Retrieved 7 December 2011. ^ "Letters: Marx–Engels Correspondence 1893". Marxists Internet Archive. Retrieved 7 December 2011. ^ Lilla, Mark (25 May 1995). "The Riddle of Walter Benjamin". The New York Review of Books. Marx, Karl (1977). Preface. A Contribution to the Critique of Political Economy. By Marx, Karl. Dobb, Maurice (ed.). Translated by Ryazanskaya, S. W. Moscow: Progress Publishers. Retrieved 21 April 2018 – via Marxists Internet Archive. Seligman, Edwin R. A. (1901). "The Economic Interpretation of History". Political Science Quarterly. 16 (4): 612–640. doi:10.2307/2140420. JSTOR 2140420. Thompson, E. P. (1965). "The Peculiarities of the English". Socialist Register. 2: 311–362. Retrieved 21 April 2018. Blackledge, Paul (2018). "Historical Materialism" in Oxford Handbook on Karl Marx. doi:10.1093/oxfordhb/9780190695545.001.0001. ——— (1887). Engels, Friedrich (ed.). Capital: Critique of Political Economy. Volume I: The Process of Production of Capital. Translated by Moore, Samuel; Aveling, Edward. Moscow: Progress Publishers. ——— (1956). Engels, Friedrich (ed.). Capital: Critique of Political Economy. Volume II: The Process of Circulation of Capital. Translated by Lasker, I. (2nd ed.). Moscow: Progress Publishers. ——— (1964). Hobsbawm, E. J. (ed.). Pre-Capitalist Economic Formations. Translated by Cohen, Jack. London: Lawrence & Wishart.